(14 mins) In this episode, Harold Reitman, M.D. speaks with Lori Butts, J.D., Ph.D., the president and director of the Clinical & Forensic Institute, and previous president of the Florida Psychological Association, about Bipolar disorder. 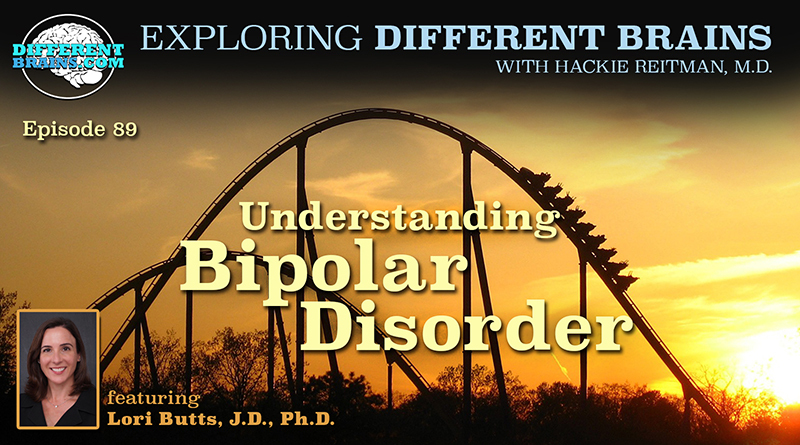 Dr. Butts discusses what bipolar is, what common treatments are, and highlights the importance of support for individuals with the disorder. HACKIE REITMAN, M.D. 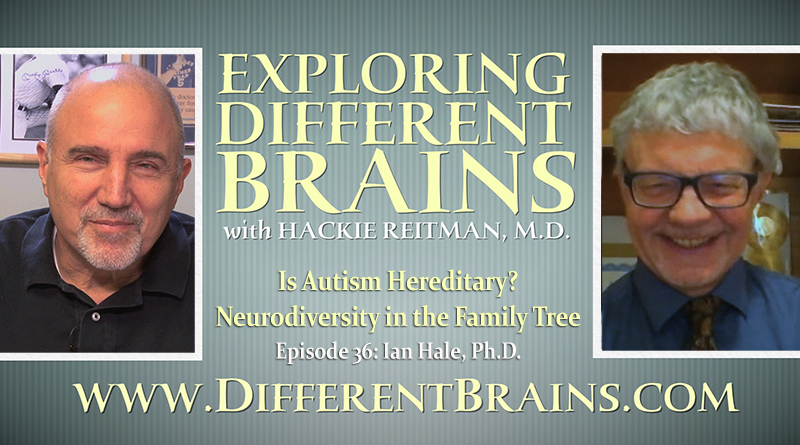 (HR): Hi I’m Dr. Hackie Reitman, welcome to another episode of Exploring Different Brains and for this episode we’re going to talk about bipolar disorder and we have none other than my friend, Dr. Lori Butts, the outgoing President of the Florida Psychological Association and the head of the Clinical and Forensic Institute. Dr. Lori Butts, welcome. LORI BUTTS J.D., PH.D. (LB): Thank you for having me. HR: Lori, first introduce yourself to our audience so they know more about you. LB: I’m Lori Butts, I’m a psychologist and an attorney. I licensed as a psychologist in both Florida and Colorado. I mainly practice as a forensic and clinical psychologist so I evaluate people and I treat people. That’s kind of basic way to explain what I do. HR: Please explain for our audience exactly what bipolar disorder is. LB: Bipolar disorder is a mood disorder. So it’s a genetic disorder, a mental illness that affects people’s moods where sometimes they feel very depressed and sometimes they have these episodes of mania. Mania is a high-energy feeling like you’re on top of the world, people tend to spend a lot of money that they don’t have, and they do impulsive behaviors during a manic phase. During a depressed phase, they’re very depressed, hard to get out of bed, having thoughts about not wanting to live, things like that. HR: I have I’ve been accused of being a hypomanic. Late great, Dr. John Spence, who you worked with extensively, told me that I was hypomanic and when I looked it up, I said, “you know you’re right and I like hanging around hypomanic people. We’re like delusional, we think we can do anything and we get all excited about and we laugh about a lot of stuff and we make no sense.” What did I leave out? LB: Well, with hypomania is actually, if you can keep it under control, its actually serves a good function so we know that a lot of successful people tend to be hypomanic because they have less energy their brains work faster they’re personable so CEOs of companies, people that are successful, tend to have that little extra edge where they don’t require as much sleep as other people, they can multitask, they can get things done but they’re also a pleasure to be around like yourself. But sometimes, you know it’s so it’s all in balance. So when it’s in balance, it can be a positive thing where it makes you have confidence and feel like you can do whatever that gives you that extra boost. Sometimes in bipolar disorder and mania, it goes off the rails where it’s it can become delusional, seriously delusional, really impact people’s lives, cause people to go bankrupt because they feel like they have this a never ceasing amount of money so again you know we talk a lot about spectrums. So on the spectrum, it’s whether or not that is causing a problem in someone’s life. HR: So when we talk about bipolar, we’re talking about extremes this way and extremes that way. HR: Okay, how does it fit into the broader category of mood disorders? In other words, where is it on the pecking order and give us some examples of other mood disorders. LB: So bipolar disorder would probably be one of the most insidious mood disorders meaning it causes a significant amount of impairment when people have these mood swings and they have these problems. Other types of mood disorders would be depression. So depression is part of bipolar disorder but people that have depression they don’t have that mania, they don’t experience that. So and there’s a type of mood disorder where there’s kind of a this underlying depressive belief system that doesn’t rise to the level of depression but it’s kind of always there were somebody’s just as maybe you would recognize them if somebody who’s very pessimistic, always seeing the negative, feeling like the world’s against them and that would be another type of mood disorder. So bipolar disorder, it causes more hospitalizations, more interference with somebody’s life than other disorders, I mean depressions up there as well. It’s pretty significant. HR: How do we treat it once we diagnose it? LB: So bipolar disorder is actually a highly treatable disorder. We have good medications. I’m not a psychiatrist but there are good mood stabilizer medications that remediate bipolar disorder to the point where someone may not appear symptomatic if they take their medication. The problem with bipolar disorder is once somebody gets on medication and they feel good like a lot of other diabetes and we can go through the whole list of disorders that people have, once they feel that it’s under control, they stopped taking their medication and once they stop taking their medication, it’s called a cycle back into the disorder whether they can get depressed or whether they have a manic episode. So the problem with bipolar disorder is keeping people stable. We can we can treat it really well with medication and with therapy and that’s where the psychologists come in to remind the person that they do have this disorder and they need to take their medication on a long-term basis and support them while they’re taking their medications so that this is part of you know you help make the person understand that this is part of their life, this is part of their daily routine and they need to take the medication just as somebody with diabetes needs to take medication, somebody with high blood pressure, those types of it’s a treatable disorder. HR: Are any kinds of entities that get confused with bipolar disorder? LB: Sure, there’s personality disorders that get confused with bipolar disorder and certainly depression and hypomania can be confused with bipolar disorder. There are no schizophrenia can be confused as bipolar disorder or just people with high energy. They may have high energy be very driven. Some people don’t require a lot of sleep and they don’t have hypomania. So, the most confusing the two disorders that get confused the most are borderline personality disorder and bipolar disorder. HR: When you just described how bipolar can be treated successfully with a combination of medications on the one hand and balanced with therapy, this sounds like the perfect kind of thing that we hope that psychologists and psychiatrists are working together on. Could you comment on that? LB: It’s so important for psychiatry and psychology to be working together with people with major mental illness especially with bipolar disorder because psychiatry has a mood-stabilizing medication, works very well with people with bipolar disorder and psychologists help maintain that person during the periods of time where they’re stable or where they’re not stable where they need to remind them to take their medication or maybe something needs to be adjusted so the psychologist can on a weekly or monthly basis monitor how the person is doing see what’s going on see if they’re becoming symptomatic and need to go back to the psychiatrist. So a treatment team approach is really essential and so helpful. HR: Is it more covering in males or females? LB: Oh, I don’t know, um, I don’t I don’t I don’t know. I don’t know the prevalence about that. I know that the prevalence rate for bipolar disorder in the US is 2.5 percent but I don’t know if there’s a difference. HR: 2.5% of all of us have bipolar. That’s a big number. LB: That’s a big number. HR: What’s the biggest thing our audience and someone like me might not know about bipolar? LB: I think what people might not know about bipolar disorder is how treatable it is. I think that that is the biggest thing. I think that people need to know that it’s a treatable condition, people can live their entire lives being stable and having seeing a psychiatrist regularly and have successful lives even when being diagnosed with bipolar disorder. HR: And I want you all out there to please understand, that’s why we have to get rid of the stigma. Here’s a perfect example of something that’s perfectly treatable and yet people are afraid to even mention to somebody they have it, they’ll be discriminated against in school, at work, and in society in general. We’ve got to get rid of the stigma and if one of our friends if we know about it is off their meds, help get them back on their meds. The same as you would if you had a friend who was diabetic and didn’t take their insulin was getting a little wacky, so you know. Keep that in mind, that’s what we’re trying to do here. If anybody in our audience has just been diagnosed with bipolar and they were afraid of what it means, you’ve already told them it’s very treatable, what else might you say to them to encourage them? LB: I think getting a team involved, a psychiatrist and psychologist involved, getting family members involved, getting educated. Again, this is a genetic disorder, so there’s a high likelihood that somebody in the family also has bipolar disorder, so this you know you see it generationally that maybe somebody had a substance abuse problem and was never diagnosed with bipolar disorder or the aunt was eccentric and she probably had bipolar disorders so it’s a time for the family to be supportive, to not be scared to understand that it’s treatable. It’s not just I have to explain this, it’s not just manageable, it’s treatable. Bipolar disorder, there is hope for a successful, happy life and mental health professionals are there to assist at all times. HR: And this again is another example of where as our friend, Temple Grandin says about medications where there should be a balance between medication and behavioral. HR: And what we’re finding especially in today’s day and age of everything being partisan, is that you’re either in the medical camp or you’re in the non-medical camp. And that’s no, no, no, no. We want whatever can help the individual in proper balance, not to be abused and the balance you’ve heard here today from Dr. Lori Butts is a perfect example of how we can all benefit from this. In this case, with bipolar disorder. LB: I think you’re exactly right. It’s very important that not only somebody takes the medication but also gets the support and assistance for understanding the disorder, understanding when they’re starting to have symptoms, understanding how it impacts their lives and how to manage the symptoms and how to reach out to get assistance when they need it. HR: Lori, if someone in the audience wants to get in touch with you, how do they do that? LB: They can go to my website, which is CFI experts.com. It’s the clinical and forensic Institute. HR: Dr. Lori Butts, thank you for speaking us – Dr. Lori Butts, thank you for speaking with us today. Always a pleasure to see you, Lori. Thank you very much. LB: Thank you for having me Hackie, it’s a pleasure. (3 min 45 sec) In this episode: a Colorado student with Down syndrome hits a half court shot, a club in New Jersey looks to help those with Alzheimer’s and dementia, a young man with autism expands his pickle business, and more! In this episode, Harold Reitman, M.D. 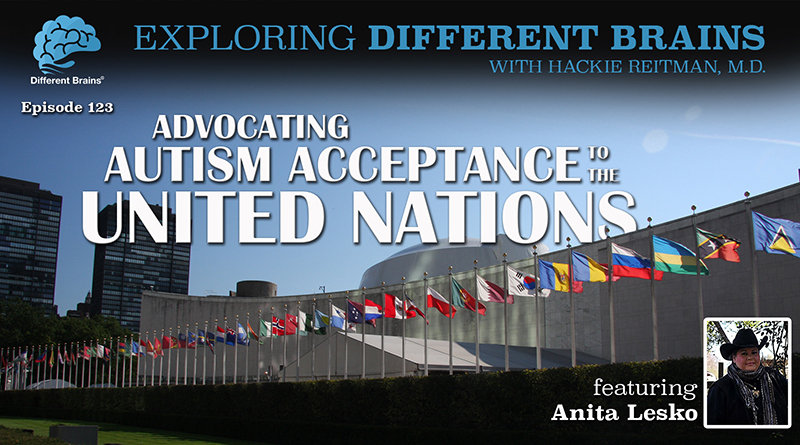 speaks with Ian Hale, Ph.D., a writer, poet, public speaker and researcher who happens to be on the autism spectrum.